The province reveals designs for a new green space along the eastern edge of the complex. The map of the proposed park on the east side of Ontario Place. 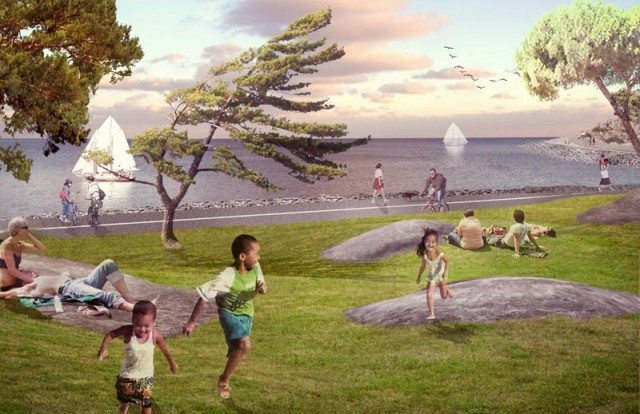 The park will occupy the long narrow band running horizontally across the bottom edge of the Ontario Place complex as seen in this view. Photo by <a href="http://www.flickr.com/photos/lindaedwards/5266485498/">L.S. Edwards</a> from the <a href="http://www.flickr.com/groups/torontoist">Torontoist Flickr Pool</a>. Looking east from the "romantic garden." Because nothing is more romantic than children running wild. The rocky "scramble," designed as both a play area and an access to the upper, forested level of the park. Taking in sunset at the park's southern summit. One of the few hints on how the park may be used during the winter. Is there a permit for that fire? The Mobius strip-inspired main pathway will offer a continuous loop around the park. The west side of the park will be an elevated evergreen forest, which will shelter the lower side from lake winds. Closer to the water, users may relax on smooth pieces of granite, run up and down a rocky “scramble” connecting the park’s two levels, and stare at the city skyline from a summit at the south end. The current goal is to complete the park in time for the 2015 Pan Am Games. An online survey has been set up to gather public reaction to the proposal. That feedback will be used to refine the design and another round of public feedback will be solicited in the spring. Images courtesy LANDinc and West 8.